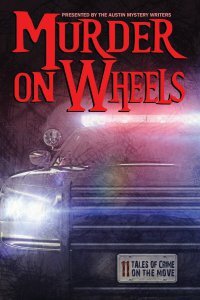 MURDER ON WHEELS, Austin Mystery Writers’ first crime fiction anthology, has been released by Wildside Press. Since it appeared, the Writers have been difficult to live with. We’ll get over it, but only after a decent interval of frolicking. For a sample of what’s between the covers, see below. Reavis Wortham and Earl Staggs aren’t Austin Mystery Writers–they’re Texas authors who kindly contributed stories to the anthology. We’re pleased they joined us. When Austin Mystery Writers was formed twelve years, members had no intention of publishing anything together. They (and we) simply wanted to improve their writing. The idea for MURDER ON WHEELS came from banter via email late one night. Ramona DeFelice Long edited the manuscript. Wildside Press published it. Modified rapture! And now we frolic. The moral–must be a moral!–of the story is this: Creativity begins in play. This morning another group email arrived: When will we begin the next anthology? Well, one thing does lead to another. . . I think Whopped in a Wheelbarrow sounds good. But if we do another anthology, we need another theme. How about Bad People at Work and What We Did to Them? Can we talk about that certificate? It was never signed. I’m bringing it to Malice to get it made official. You’ll have to pretend it’s January 10, 2013. I’m going to make you a new one. I realized today I got the title wrong. Maybe I can find a certificate that has something that has something more appropriate than a bull. I think we didn’t sign it because the table was covered with water or gravy or something like that. And Gale and I were distracted because we were trying to work up the nerve to grab you and throw you in the trunk and take you back to Austin. Think the Malice pooh-bahs would do a special presentation at the Agatha banquet? We could actually try to get an Author’s Alley next year and tell about putting an anthology together. I think a lot of groups want to do that. That sounds like fun, but first you’ll have to explain what an Author’s Alley is. Or I guess I’ll find out in the next couple of days.